Matala is mostly known for its artificial caves, created in the cliff of the Matala bay in the Neolithic Age. A place of ancient history, Matala still keeps its archaic charm, and although it is not one of the most popular Greek destinations you could think of, Matala features one of the best beaches in Crete, and a rich historic legacy reflected in ancient ruins, and archaeological sites. In the 1960s, the hippies discovered the beauty of this place, and camped in Matala’s famous caves. Many have returned since, fascinated by the charm of the island. 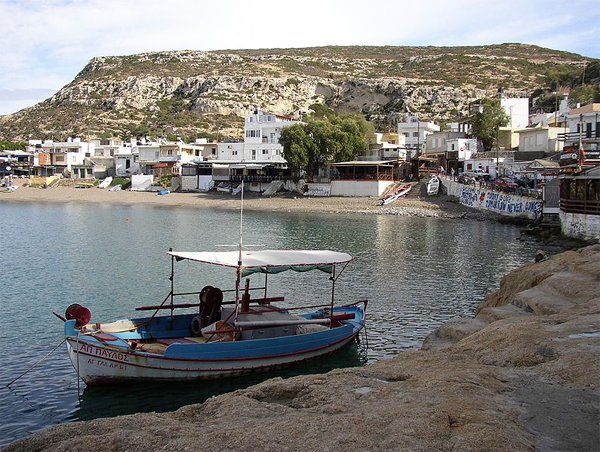 This year, Matala celebrates its main tourists with a free festival: the Matala Festival 2011. There are many participants expected, at all they have to do to attend is the journey: there will be free camping on the Matala camping site next to the beach in the festival days. The festival is scheduled for Saturday the 11th to Monday 13th of June 2011. The event is designed as a reunion of the hippies, who were staying in the caves in the sixties and seventies and not only. This is a full cultural event for all ages, with live music, beach parties, right in front of the famous caves with music from sixties / seventies – the sound & music of the legendary Woodstock festival … an attractive program with lots of (live-) music and party feeling all kind of activities like Hippie bazar, and Hippie events acoustic live music, concerts, happenings, exhibitions, children fun park and so much more. Below, a beautiful homage to Matala by the Danish singer and songwriter Pat Zanetti.